Leading off today: Jack Stube's conversion in a penalty-kick shootout proved to be the winner as Canisius earned a 2-1 boys soccer victory over McQuaid on Saturday in the Catholic Cup tournament. Trailing late in regulation, Canisius equalized on T.J. Burgio's goal and held steady in 20 minutes of scoreless overtime against the 2017 NYSPHSAA Class AA champions. "It's perfect preparation for sectional time," McQuaid coach Nino Pilato said. "Our team went out two years ago on kicks, so a high-pressure situation is a good thing." McQuaid will travel to play at Canisius on Sept. 24. Streak extended: Hamburg posted its seventh straight boys soccer shutout, beating Williamsville East 1-0 as Nate Neudeck made 10 saves. Hamburg has outscored opponents 30-0 since a 1-0 loss to Kenmore East to open the season. Williamsville East began the week at No. 4 and Hamburg at No. 14 in the state in Class A according to the New York State Sportswriters Association. Senior midfielder Seth Heeter's corner kick set up Andrew Lauria for the winning goal on a header in the 37th minute. Girls soccer: Rye and Pearl River have one of the better rivalries in the sport at the moment, and the latest matchup between the Section 1 schools was another tough battle. Pearl River won 1-0 as sophomore Kylie McNally banged home a corner kick off the body of a Rye defender. in the second overtime to settle the rematch of last year's dramatic four-overtime sectional Class A final. The Pirates improved to 3-0. Rye is 2-1-1. Fan clashes halt game: Rochester police made three arrests after a series of fights among spectators that led to the suspension of the football game Saturday afternoon between undefeated Wilson and East at Marina Auto Stadium. Police reported a 17-year-old city resident walked into Strong Memorial Hospital with at least one cut wound to his upper body that may have been sustained at the stadium. The game was delayed for 45 minutes after a fight broke out midway through the second quarter. The remainder of the half was played before police cleared the stadium of spectators and participants. The Democrat and Chronicle reported it was unclear what triggered the fight, which did not involve players. Wilson was leading 12-6 when the contest was called, and it was not immediately clear if or when the game would be resumed. Forfeits pending? Nottingham's game at Corcoran started at 8 a.m., a preventative measure aimed at keeping attendance low and emotions in check in light of recent bad blood. The early start was hardly the day's key development. After trailing 8-0 at halftime, Corcoran posted 30 fourth-quarter points to cruise to a 38-8 victory that apparently will count as the Cougars' first victory of the season rather than their third. 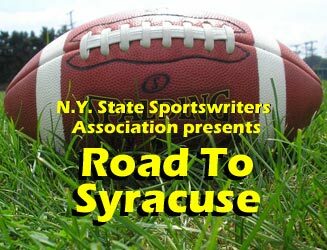 Syracuse.com reported Corcoran, ranked 24th in the state in Class AA, apparently will have to forfeit season-opening wins vs. Baldwinsville and West Genesee for using a player who should have been serving a one-game suspension related to his ejection from a playoff loss at Cicero-North Syracuse last season. Corcoran coach Tyrone Fisher confirmed that senior all-state linebacker and running back Cincear Torrence was the player in question. Torrence was ejected for unsportsmanlike conduct during the playoff game. The need to bench him for a game to start this season slipped past the Corcoran coaches and administrators. "You know, it was my fault. Because I should have caught it," Fisher said. "And I told the kids, yesterday and today, it's on me. Cincear and I talked about it at one point, and I made a mistake and forgot about it. It's on me." West Genesee AD Mike Burns said he received a call from Corcoran AD Jim Palumbo about a potential forfeit, but Burns said he's had no official word. After the game, Palumbo said he couldn't talk about the potential forfeits or the circumstances of Saturday's early start. More on Corcoran: The New York State Public High School Athletic Association holds mandatory meetings each year for athletic directors in each of the organization's 11 sections. The emphasis is on presenting reminders of recent rules changes and also offering a refresher course on long-standing rules. The presentations generally don't change too much from year to year, but Executive Director Robert Zayas does have a history of throwing new slides into the Power Point to reflect issues and errors that have cropped up in the past year. I strongly suspect that Zayas wrote a note to himself this weekend to make the suspension rule a point of emphasis for next year's AD meetings, because the Corcoran screw-up that apparently necessitates two forfeits is about as bad as it gets for mistakes that don't create a potential health or safety issue. Coincidentally, my latest weekly column for the Press & Sun-Bulletin is about the mandatory AD meetings. The presentation includes a refresher course on one rule in particular that consistently gets violates by at least one school each year -- and almost always for no valid reason. Sec. 6 player hospitalized: Lancaster senior and three-year starter David Gaca experienced such severe cramping during Friday's victory by the top-ranked Legends over Williamsville North that he had to be hospitalized, The Buffalo News reported. Gaca was one of approximately 20 Lancaster players who battled a flu-bug/virus during the week, and several missed Friday's game. Though he felt good and drank fluids during the game, Gaca was felled by debilitating cramping once Lancaster returned to school after the game. Gaca was hoping to be released from the hospital Sunday. His status for Friday's game vs. Clarence is uncertain.